This first level of study of Healing Touch covers concepts and skills in energy-based therapy. The theoretical concepts that underlie holistic healthcare practices are explored along with how these concepts relate to the core values which guide the practice of Healing Touch. Healing Touch techniques used in the etheric field are acquired along with an understanding of how these techniques interface with the human biofield. 18 continuing education contact hours. Additional Fee for textbook "FOUNDATIONS AND PRACTICE OF HEALING TOUCH" which is used for all 5 practitioner course levels. The Healing Touch Certificate Program has been in place since 1996. 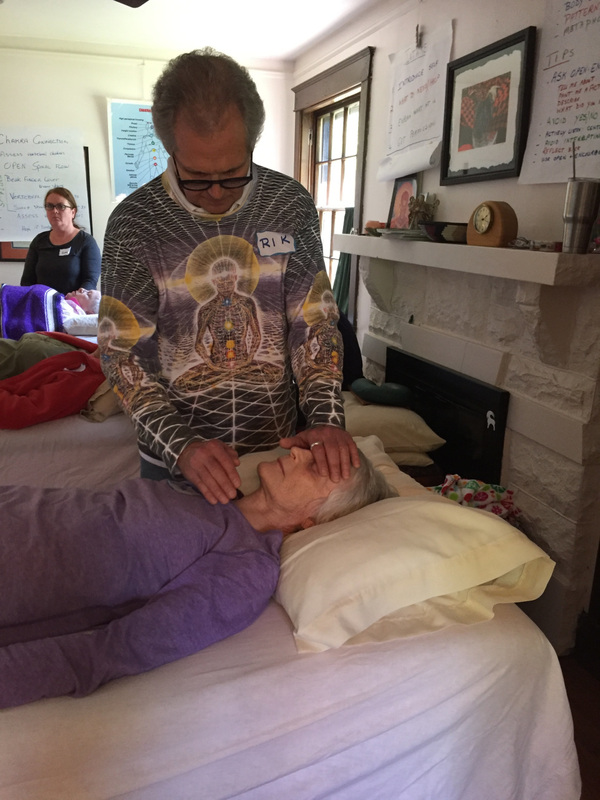 It is the continuing education program of Healing Beyond Borders, with classes that are sequenced through five* levels using didactic and experiential learning modalities. The HTI Healing Touch Certificate Program offers continuing education through the American Holistic Nurses Association (AHNA), National Certification Board for Therapeutic Massage & Bodywork (NCBTMB), and the California Board of Nursing. The first three course levels of Healing Touch are described below. Go to HealingBeyondBorders.org for descriptions of 4th and 5th Levels as well as Advanced Practice classes and the certification process. This first level of study of Healing Touch covers concepts and skills in energy-based therapy. The theoretical concepts that underlie holistic healthcare practices are explored along with how these concepts relate to the core values which guide the practice of Healing Touch. Healing Touch techniques used in the etheric field are acquired along with an understanding of how these techniques interface with the human biofield. - Explore qualities and self-care needs of a Healing Touch Practitioner. ​- Discuss the facets of Healing Touch and correlate techniques that support physical, mental, emotional, and/or spiritual healing. - Demonstrate Healing Presence: the ability to remain grounded, present, and heart-centered. - Describe personal perceptions of subtle energy/heart-centeredness. - Apply the Healing Touch Framework to a variety of healing energy interventions. - Evaluate the seven energy centers (chakras) and related energy layers that surround the body. - Describe rationale with use of specific Healing Touch techniques. - Discuss the Healing Beyond Borders Code of Ethics, Standards of Practice and Scope of Practice required of a beginning Healing Touch student. 18 continuing education contact hours. This second level is for those who have successfully completed the "Foundations of Healing Touch" course. The skill of completing an intake interview that identifies patterns of behaviors for which Healing Touch techniques may be useful in assisting a patient to re-pattern their energy field is acquired. Healing Touch techniques learned in the foundation course are integrated into applications that assist in re-patterning spinal health. The appreciation of Healing Touch progresses to a deeper level with the acquisition of a technique to assist the patient in expanding their heart energy. - Demonstrate the ability to remain grounded, present, and heart-centered while working in the energy field. - Conduct an intake interview with a plan toward intervention. - Assess the status of the chakras and biofield. - Document the process of re-patterning and balancing a patient’s biofield. - Apply techniques that support the health and comfort of the back. -Describe how the Healing Beyond Borders Code of Ethics, Standards of Practice and Scope of Practice relates to their developing as a Healing Touch practitioner. This third level is for students who desire more in-depth skills, and have successfully completed "FOUNDATIONS OF HEALING TOUCH" and "Energetic Patterning & Clinical Applications" (Level 1 and 2.) This includes: development of Higher Sense Perception (HSP), sequencing of healing techniques, working with guidance, self-healing and self-development. Methods of raising one’s energetic vibration are acquired that facilitate the student’s application of techniques that can be utilized with upper layers of the biofield. - Elevate the personal energy vibration to support upper level work. - Apply clearing, balancing, and energizing techniques to the upper energetic layers. - Deliver in-depth techniques to support spinal health. - Practice an Advanced Healing Session. Practice required of an advancing Healing Touch practitioner relates to their practice.